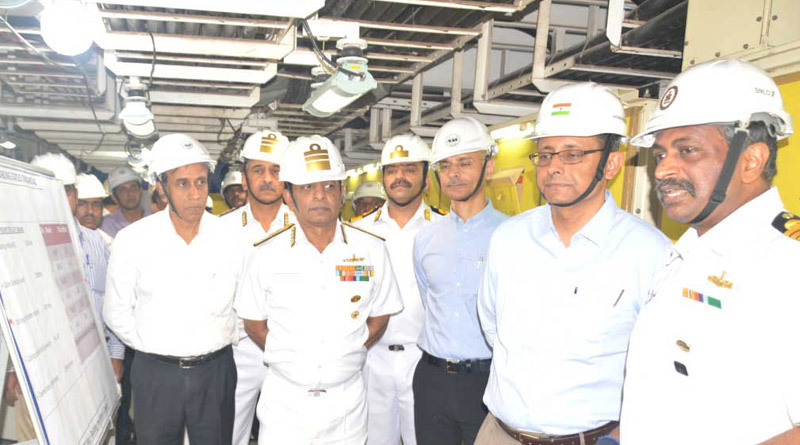 The Indigenous Aircraft Carrier (IAC) Project was reviewed by Shri Sanjay Mitra, Defence Secretary, IAS, reviewed the Indigenous Aircraft Carrier (IAC) Project at Cochin Shipyard Limited (CSL) on 19 July 2018. He was accompanied by Vice Chief of the Naval Staff, Vice Admiral Ajit Kumar, AVSM, VSM, Controller Warship Production & Acquisition, Vice Admiral D M Deshpande, AVSM, VSM, and Joint Secretary (Shipping) Satinder Pal Singh, IPS, and other senior officers from the Indian Navy. The Defence Secretary had arrived in Kochi on 18 July 2018. The Defence Secretary was given a first-hand briefing on the progress of IAC construction by the Warship Production Superintendent, Commodore Cyril Thomas during the visit. CMD, CSL, Madhu S Nair, highlighted the shipyard’s focus on outfitting and trial activities as the project enters its final phase, and re-iterated the CSL’s commitment to meet the timelines for delivery of the ship. Launched in Aug 2013 and presently, the ship’s main propulsion plant, power generation equipment, deck machinery and auxiliary equipment have been installed and integrated on board. Outfitting of various aviation equipment, navigation and communication equipment, weapons and sensors are progressing. The Carrier Acceptance & Trials Team has already commenced in-house trials of ship’s systems and the sea trials are expected to commence by early 2020.